"West Virginia woke us up," Arizona Educators Association President Joe Thomas told a cheering crowd at a protest this week in Phoenix. OKLAHOMA CITY — A teacher rebellion that started in the hills of West Virginia spread like a prairie fire to Oklahoma this week and now threatens to reach the desert in Arizona. In the deep red state of Oklahoma, the Republican-led Legislature approved money for teacher raises and more school funding, even hiking taxes on the vaunted oil and gas industry to do it. Republican Gov. Mary Fallin rushed to sign the measures into law Thursday. Oklahoma teachers were inspired by West Virginia, another red state where a 9-day strike led to 5 percent teacher raises. Oklahoma teachers haven't had a raise in a decade of Republican control and they won raises of 15 percent to 18 percent. Now, teachers in Arizona thronged their GOP-run Capitol this week, demanding a 20 percent teacher pay hike. In Oklahoma, the tax hikes on cigarettes, fuel and oil and gas production will be enough for raises averaging about $6,100 annually, as well as funding boosts for schools, support personnel and state workers. Many GOP-led states are feeling the pushback after years of tax cuts that have slashed funding for core government services such as public schools, said Lily Garcia, president of the teachers union NEA. "It has been an unmitigated disaster, and it's now coming home to roost on all those folks who blindly cut taxes, not caring how that was going to impact communities," said Garcia. The reversal on tax cuts in Oklahoma was particularly stunning, because lawmakers there included a hike on the normally sacrosanct energy industry, increasing the production tax on oil and natural gas from 2 percent to 5 percent. In the Legislature, where lawmakers needed a three-fourth's majority in both bodies to pass a new tax, the House voted even as billionaire oil baron Harold Hamm, the chairman and CEO of Continental Resources, glared at them from the gallery. Fallin, who in 2014 signed into law tax cuts on both income and energy production, signed the measures quickly with a hope of averting statewide school closures. Earlier, she praised bipartisan support of the package and said she hopes the teacher walkouts scheduled to start on Monday will instead become a one-day rally for education. FROM DEC. 31: As West Virginia teachers' strike ends, is Oklahoma next? "That'll be up to the teachers, but I hope that they can come up here, say 'thank you' on Monday and go back to the classrooms," Fallin said. In both Arizona and Oklahoma, teachers are mulling whether the current offer from the Legislature is enough to avert a work stoppage. The union in Oklahoma was demanding $75 million in new funding for education, and is expected to get $50 million under the plan. 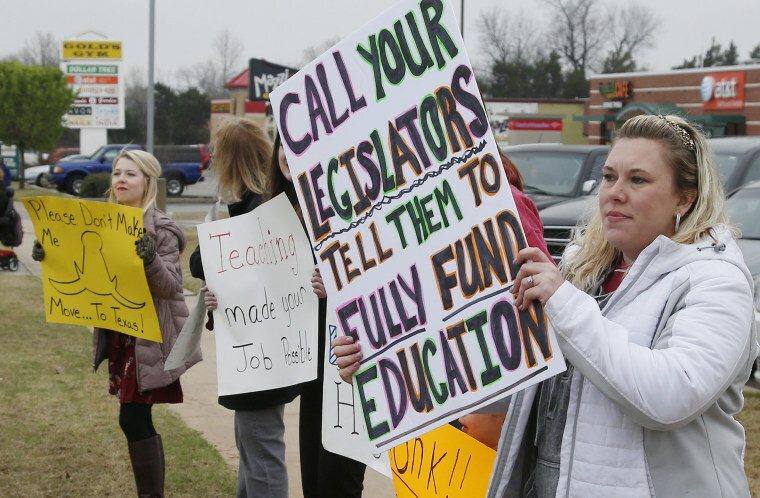 While some Oklahoma school administrators and board members are giddy over the infusion of new cash, many rank-and-file teachers are demanding that all of their needs are met before they agree to stop a walkout. "They need to fund our schools better, and until that happens, we're going to walk out," said Adrien Gates, an elementary school teacher in Norman. "We need to take this all the way. Otherwise we're settling."